Please refer to our stock # TA20071 when inquiring. 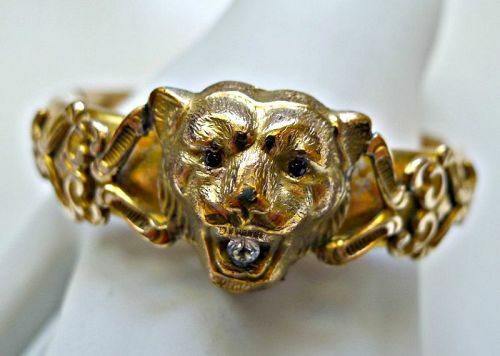 This is an antique Victorian lion's head hinged bangle bracelet. Beautifully rendered in yellow gold plate, this ornate bangle features a large lion's head in front with applied decorations on each side. With its highly-contoured face and wild mane, the lion has lots of character. Two deep red rhinestones form the eyes and a clear, brilliant rhinestone sits in the open mouth, adding sparkle. The sides are decorated with intricate metal work, while the back is smooth. The bracelet is in very good condition. The face of the lion is perfect, and there are no dents or problems with any part of the bracelet. There is a push button opener and the bracelet closes well with a snap. The internal diameter is 2-1/4 inches by 2 inches (slightly oval in shape) and the bangle is 1/2 inch wide except for the top which is 3/4 inch wide. The bracelet is marked FM Co which indicates the Finberg Manufacturing Co. -- Attleboro, MA; which began production in 1888. This is truly a fine collector's piece.